The first permanent British Resident in Nepal, sent by the East India Company in 1816, was Edward Gardner. 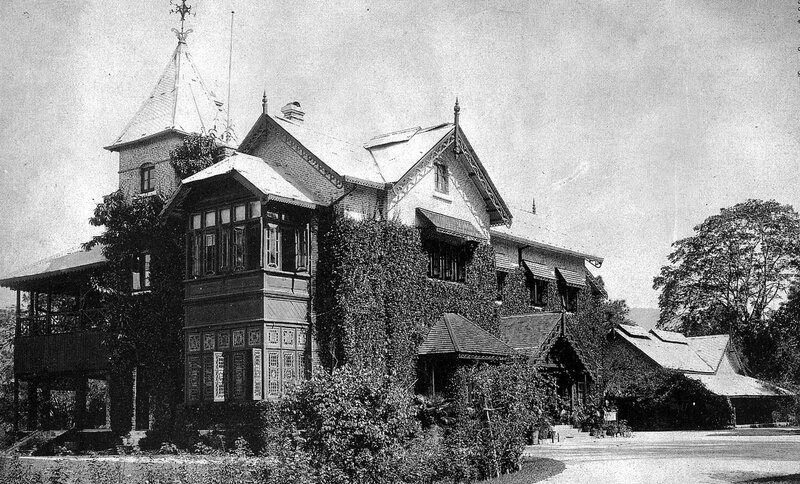 The Rajah gave him the use of a piece of land (extending to about 44 acres) in an area later known as Lainchaur, just north of Kathmandu, on which to establish his Residence. Here, rather an elegant-looking neo-classical Regency villa, with central pediment and symmetrical wings finished with white stucco, was completed soon afterwards at the Company’s expense. This house was enlarged in 1826 with a neo-Gothic stone wing that included a large hall that could be used for durbars (and later became the Residency chapel). This assemblage was first sketched by William Hodgson, the brother of the Resident, in (probably) 1828. It was painted somewhat elementarily, by an anonymous artist in the 1840s, and more expertly by the Residency Surgeon, Dr Henry Oldfield, in 1850. 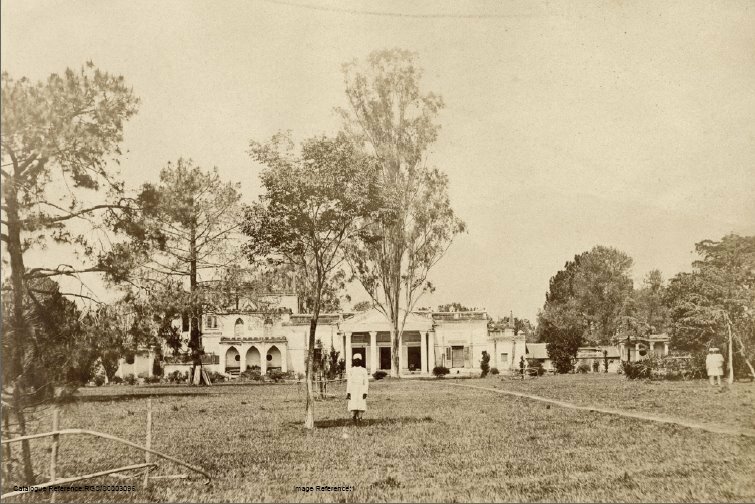 The Residency land, and the several buildings on it, passed to the British government when the East India Company was wound up in 1858. 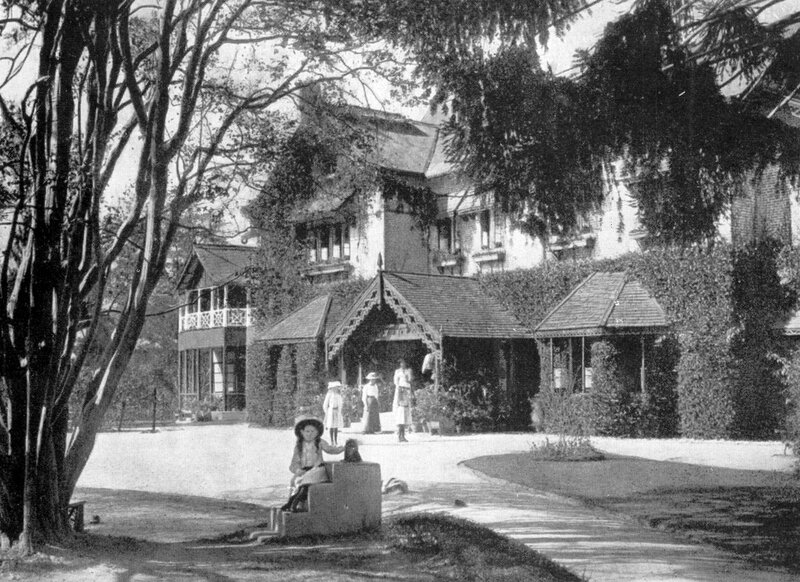 The Residency was re-built (for reasons not yet fully apparent), on or beside its original site, in 1884, in a Victorian, timber-clad, English villa style. This new building was also extended, around the turn of the century, by a wing with a large first floor terrace and a simple three-storey brick tower. The status of the Post was raised to a legation in 1923. The second Residency was seriously damaged in the great earthquake of 1934 and finally demolished in 1940. It was replaced by a new legation building in 1942: a spacious, colonnaded minister’s residence of more modern appearance, with the legation office in a rear wing. 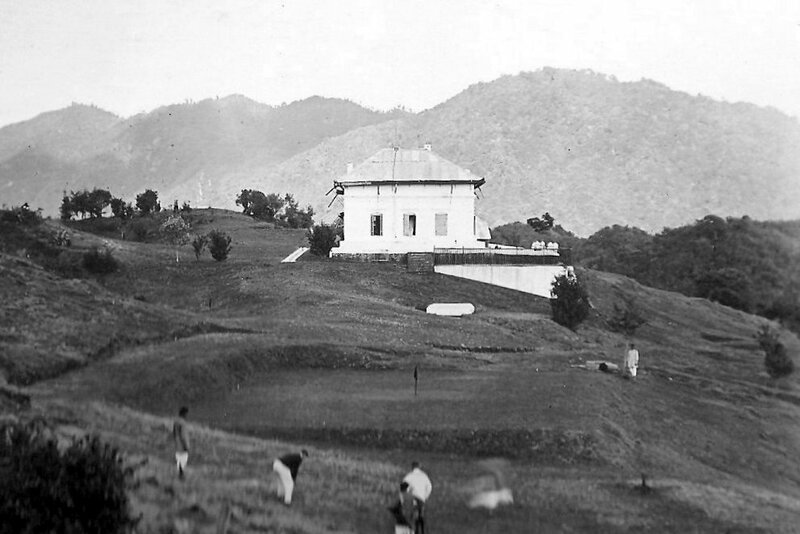 By 1947, the compound was surrounded by Kathmandu city. 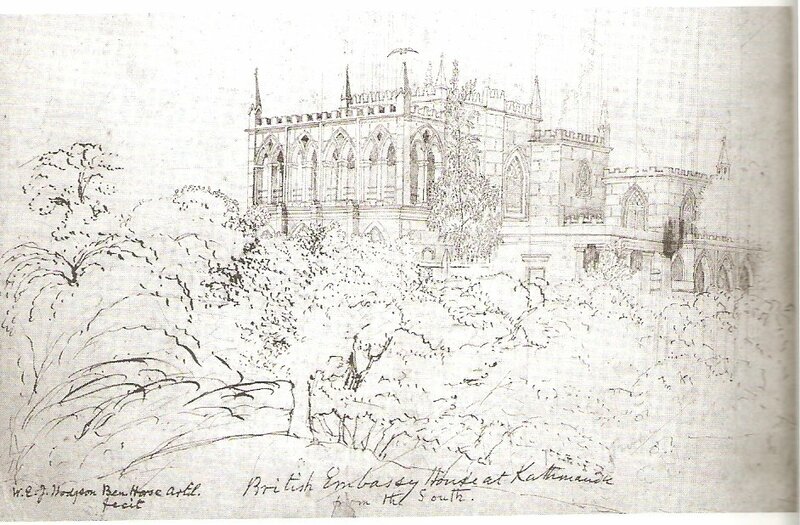 Sketch of first Residency, by William Hodgson, probably 1828. Watercolour by anonymous artist, 1840s. First Residency, painted by Dr Oldfield, 1850. First photograph of the first Residency, 1863. 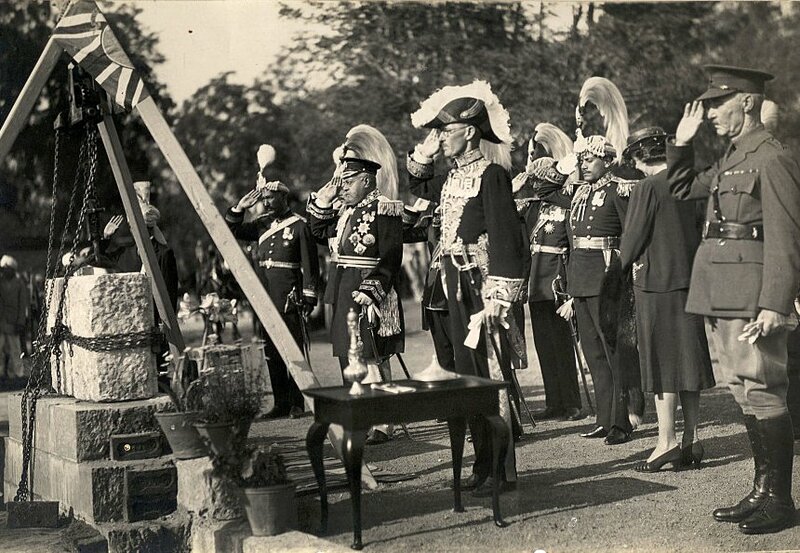 Maharajah Joodha Shumshere with Minister Sir Geoffrey Betham, laying foundation stone for new legation building, 1940. Second Residency, as extended, 1918. 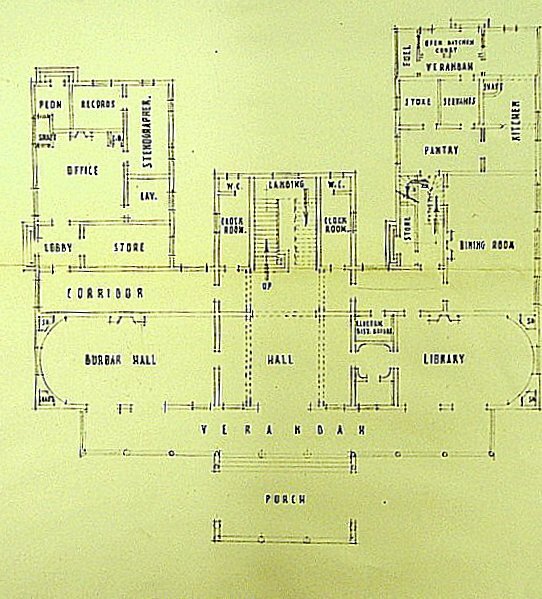 Ground floor plan of embassy building, 1948. Embassy building main front, from the east, 1953. 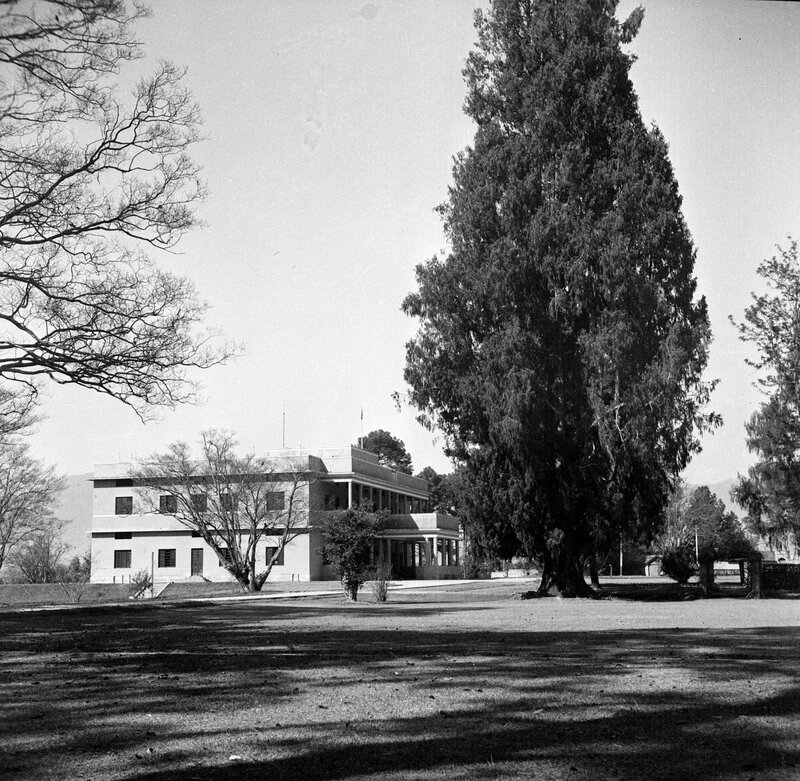 Embassy building, from the south, 1954. 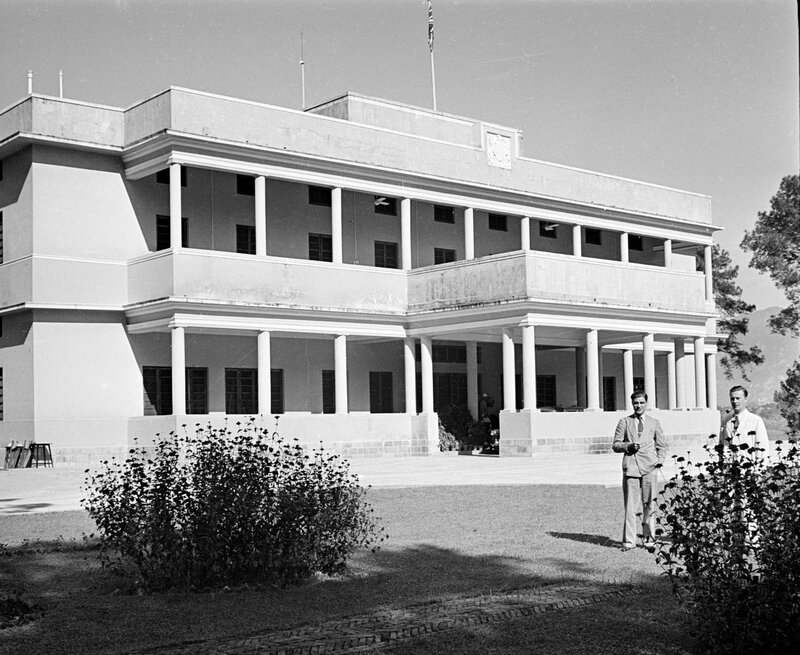 Indian Independence in 1947 meant that Britain and India needed to settle between themselves (and India with Pakistan) an equitable division of the compound for what would now become their new and separate embassies. The result, which took seven years of (sometimes fractious) exchanges and rival proposals, was that most of the 1816 compound, including its relatively recent main legation buildings, would pass to the Indians, leaving to Britain only an awkward area with two staff bungalows on it and the site of the British Cemetery. This was insufficient space for building a new embassy but the Nepalese government indicated that it would be prepared to sell an adjacent 7 acre piece of land to the Ministry of Works for £11,000. 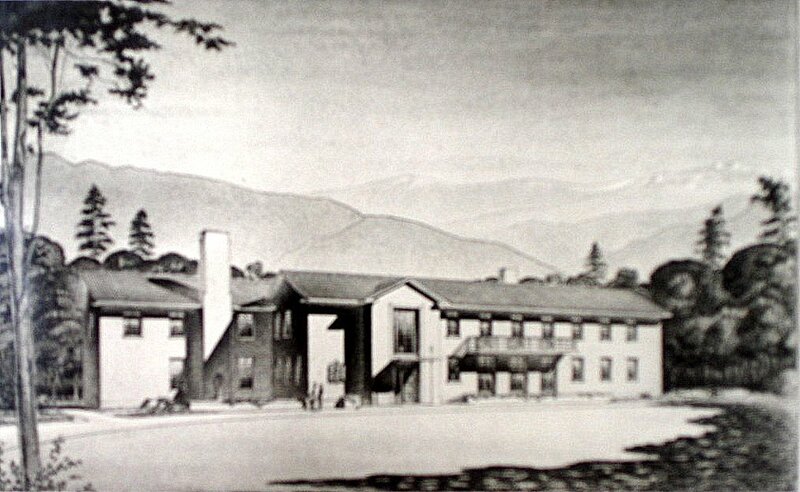 In that expectation, the Ministry commissioned designs for embassy offices from the architectural firm of Tripe and Wakeham (who proposed a small curved block) and for a residence from one of its own senior architects, Gordon Alexander (who proposed a junior version of his own (built) design for Canberra). Neither was viewed with favour but the site was nonetheless purchased in 1954. 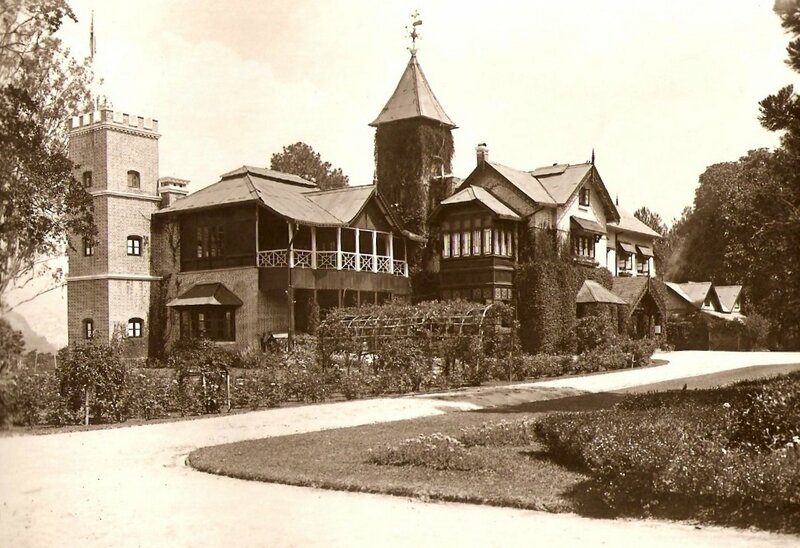 It comprised three plots: a British post office, a vacant area; and a European house called Forest House, built for (and designed by) a former Forest Adviser to the Nepal Government, Evelyn Smythies, in the very early 1940s. 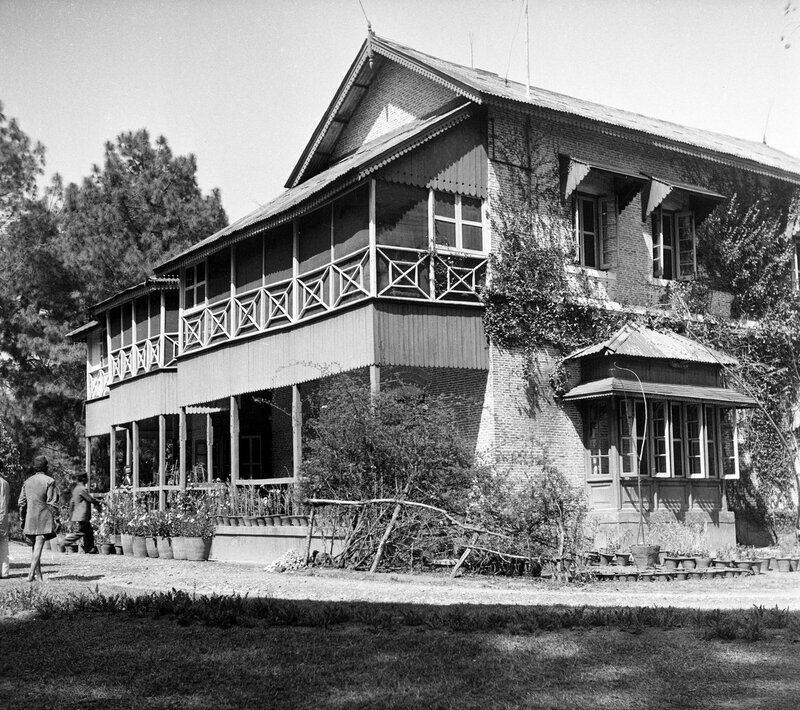 During 1953, Forest House was converted and extended to become the ambassador’s new residence (the fourth Head’s of Post house in Kathmandu); the post office was extended for the offices; and other cottages were extended for staff houses. When all was ready, on 12 March 1954, the British ambassador handed his office and residence and most of the 1816 site over to the Indian ambassador, and moved his mission 350 metres southwards.. The Nepalese proposed a diplomatic enclave in 1970 at Baneshwar but the embassy succeeded in not moving. 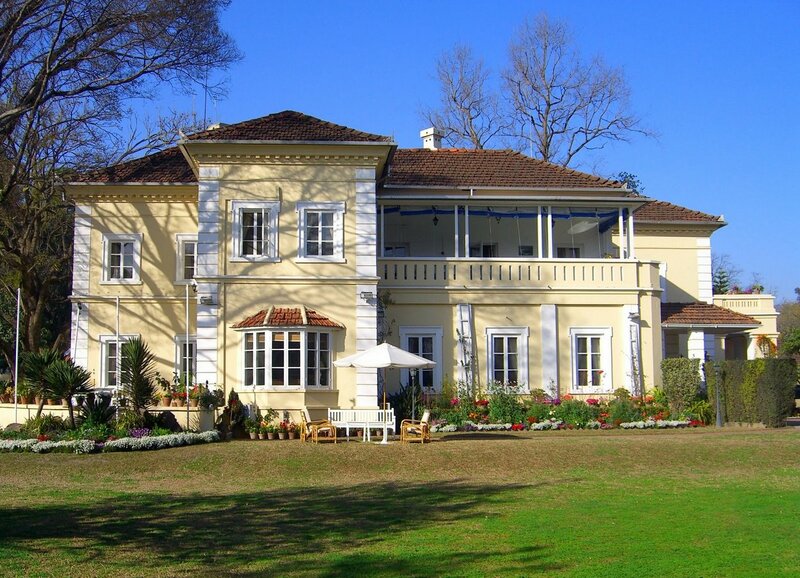 The compound at Lainchaur remains the embassy, and various buildings, including staff houses, new offices and a small hall, and sports amenities, have been built at intervals since the 1960s. A skilful retrofit in 2011 secured the residence against any damage in the 2015 earthquake. 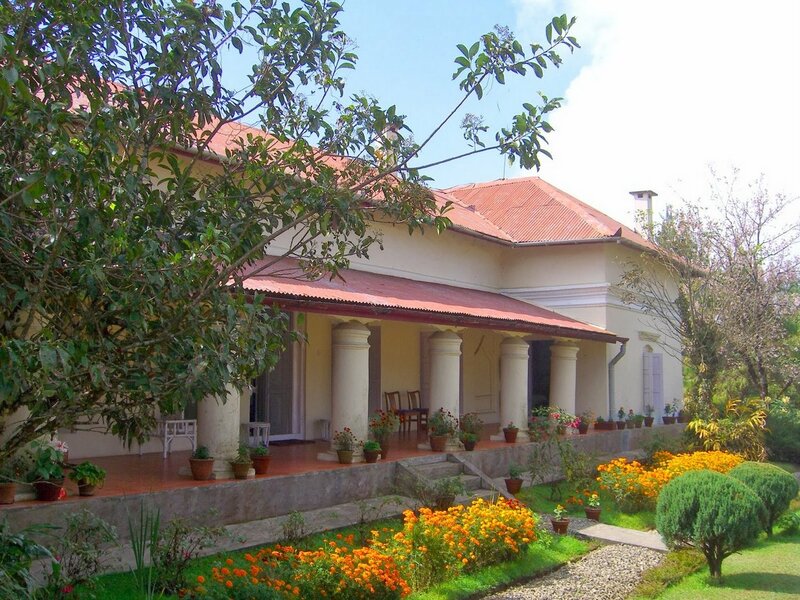 The Indian embassy remains in the former British legation building and grounds. Olive Smythies described the origin of the design for Forest House, now the residence, on pp. 152-4 of her Tiger Lady, Heinemann, 1953. 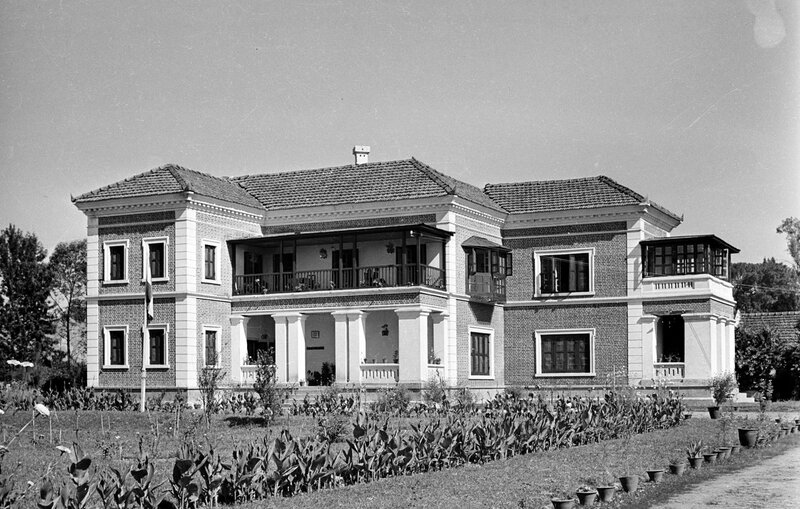 Andrew Hall, ambassador at Kathmandu, 2006-10, wrote an illuminating short account of the British residences in Kathmandu in The Britain-Nepal Society Journal No. 34, 2010, pp.21-26. I am indebted to him for other advices about this page, and he has also kindly permitted me to use seven of his photographs here. He is currently writing the history of the British Cemetery at Kathmandu. Plan of land bought from Nepalese government,in 1953, with site of Forest House bottom left, site of offices bottom right, and vacant area above. 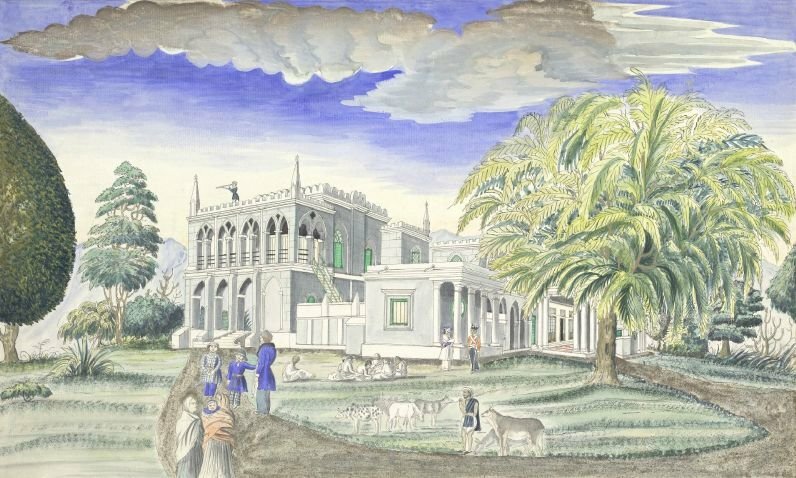 Proposal for ambassador’s residence, 1950. 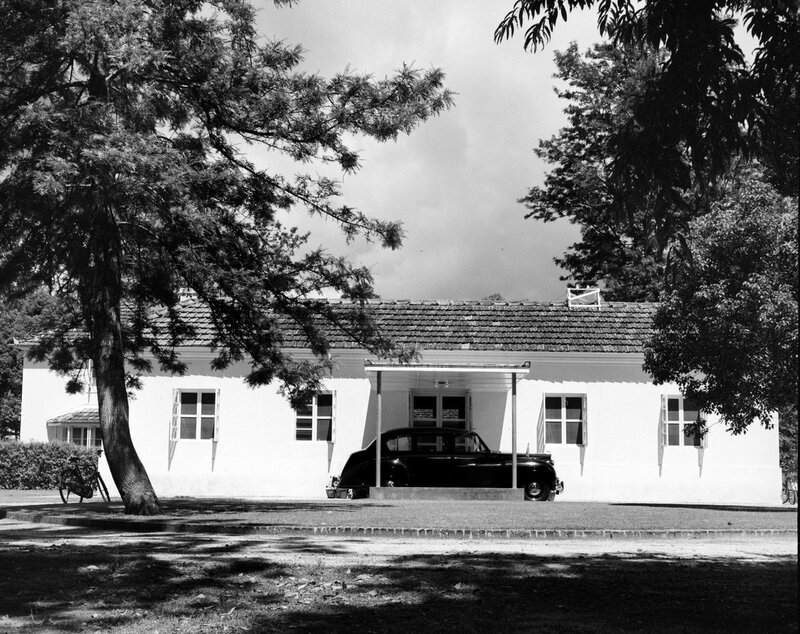 Forest House, at the time of its acquisition, with entrance across the veranda, 1953. 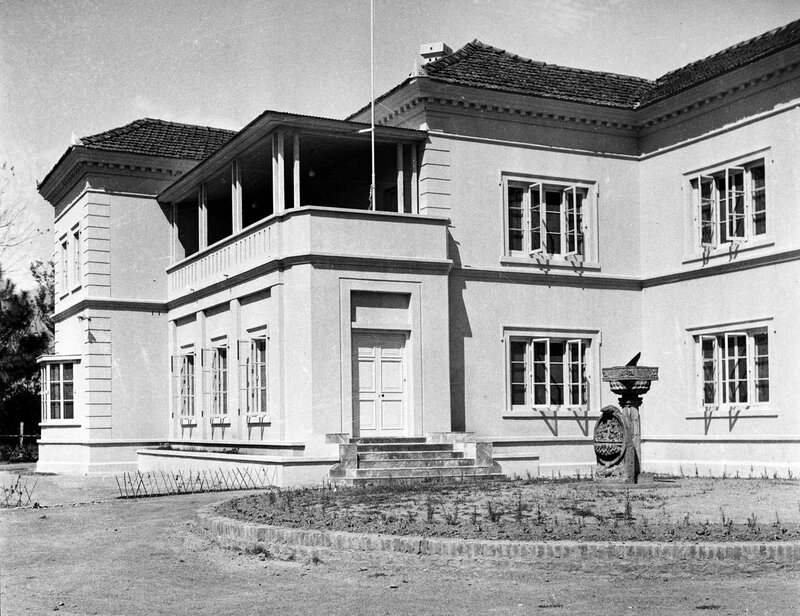 The residence, 1954, with veranda enclosed as entrance hall. 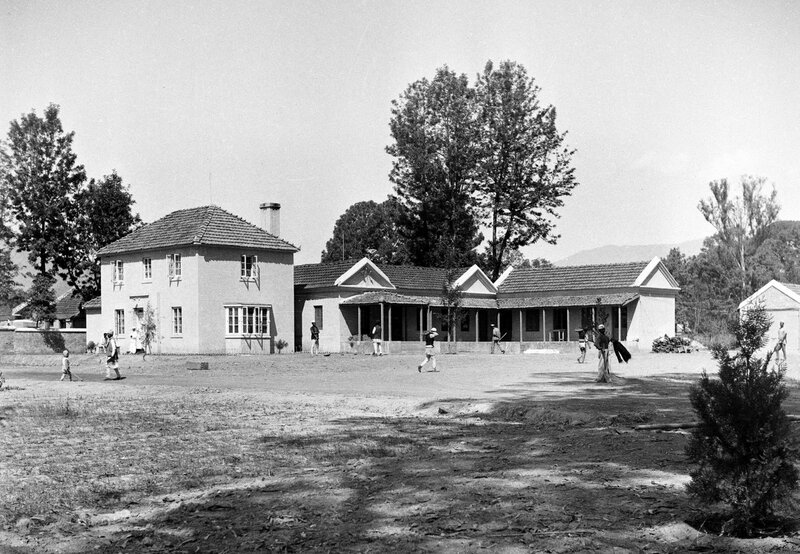 First Secretary house, on part of site retained from old compound, 1954. 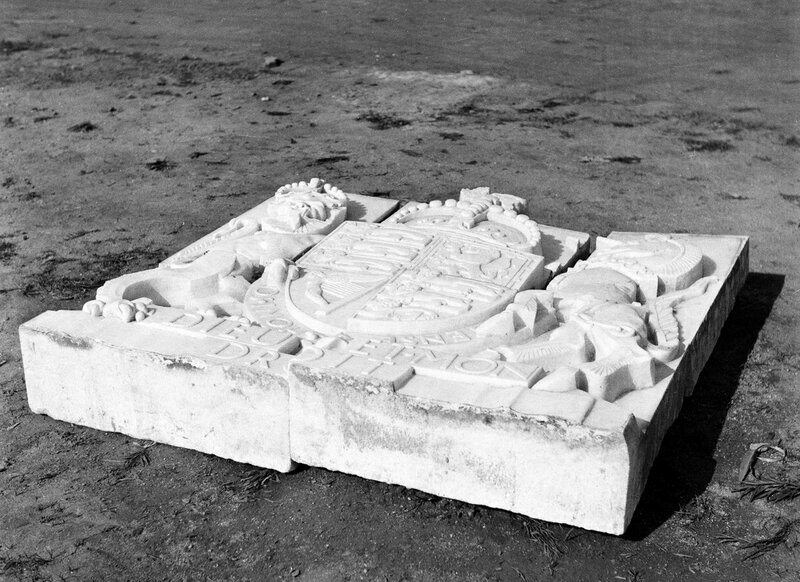 Coat of Arms, awaiting installation, 1954. 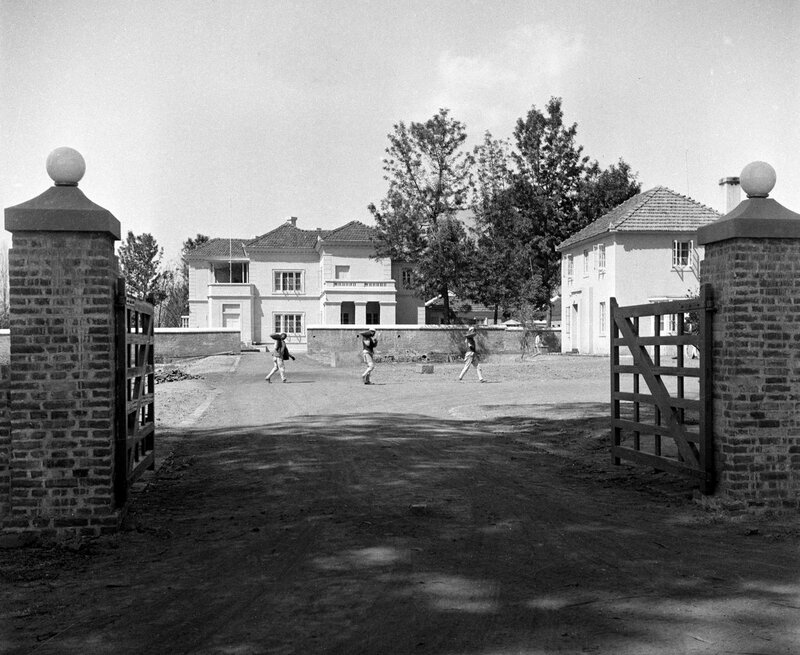 Compound entrance and drive to residence, with offices on the right, 1954. 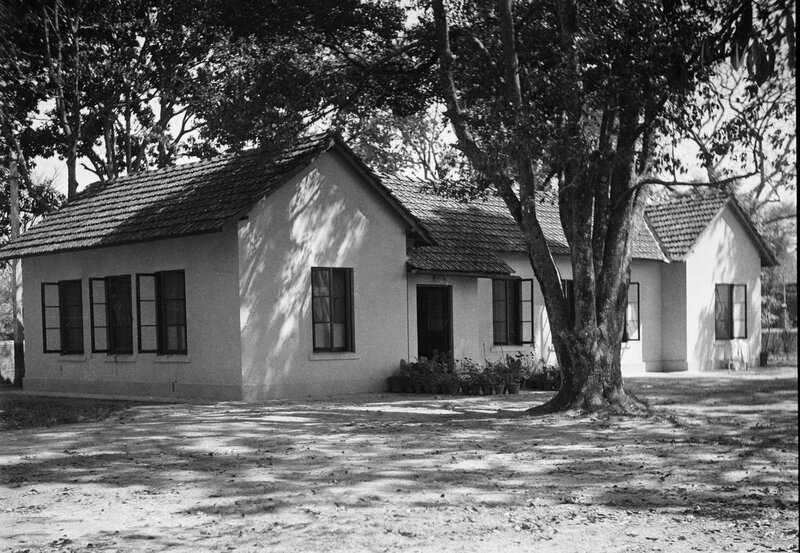 Second Secretary bungalow, close to First Secretary house, 1954. Entrance to the offices, 1964, after office courtyard was enclosed by two new wings. Junior staff house and the offices in the old Post Office, 1954. 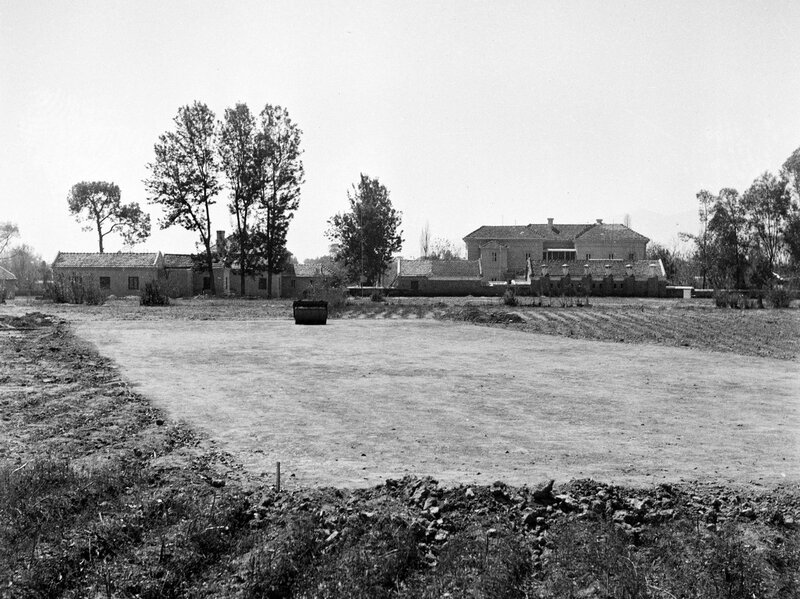 Tennis court under construction, with residence beyond, 1954. The first two Residents had the use of a bungalow at Koulia, near the village of Ranipauwa. 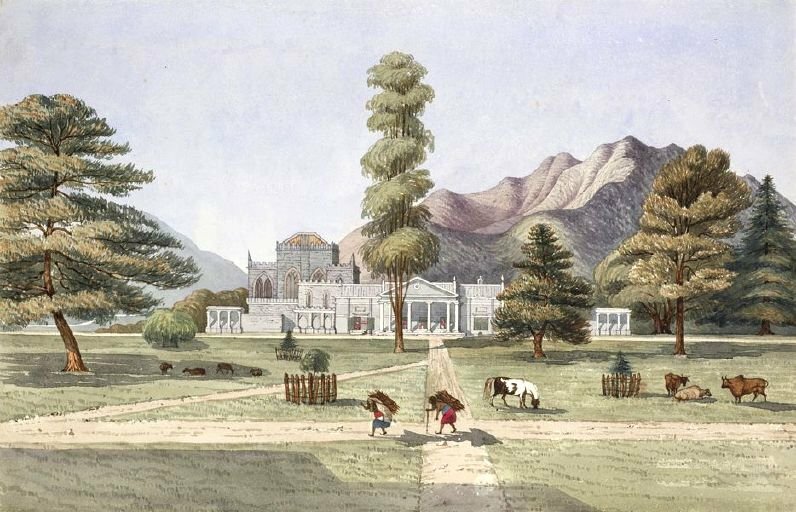 This burned down in the 1840s, and around 1850 the Rajah gave the British Resident an indefinite and free right to use a spectacular site in the nearby village of Kakani, about 30 kilometres north-west of Kathmandu on the Trisuli road. It had magnificent views of the Himalayas. and here a Resident not long afterwards built a spartan bungalow as a retreat from the city. The Ministry of Public Building and Works took over maintenance responsibility from the Foreign Office in 1965. No documentary evidence was to be found that underpinned the right of use. 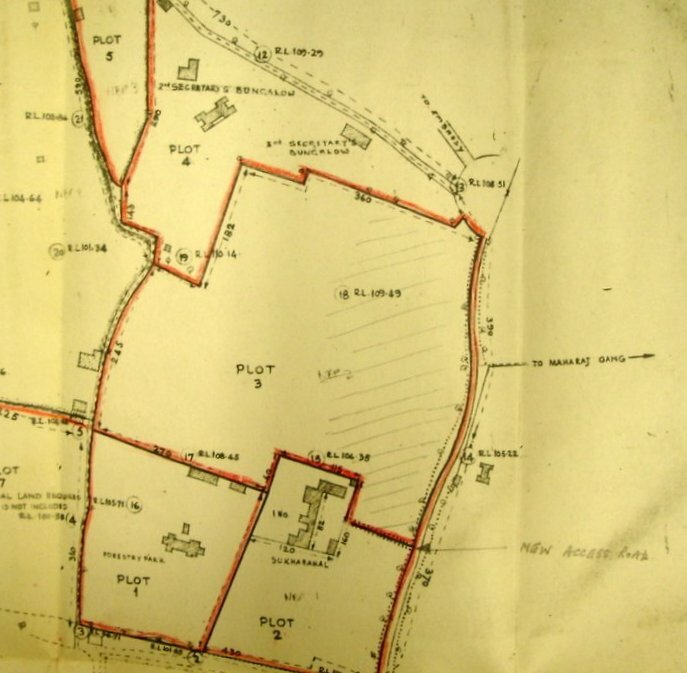 In 1971, the ambassador, Terence O’Brien, suggested to the Royal Army that they should formally take possession of the nearby old Troopers’ Lines and Chief Clerk’s House, which they occasionally used for training, in the hope that this would help consolidate Britain’s tenure. 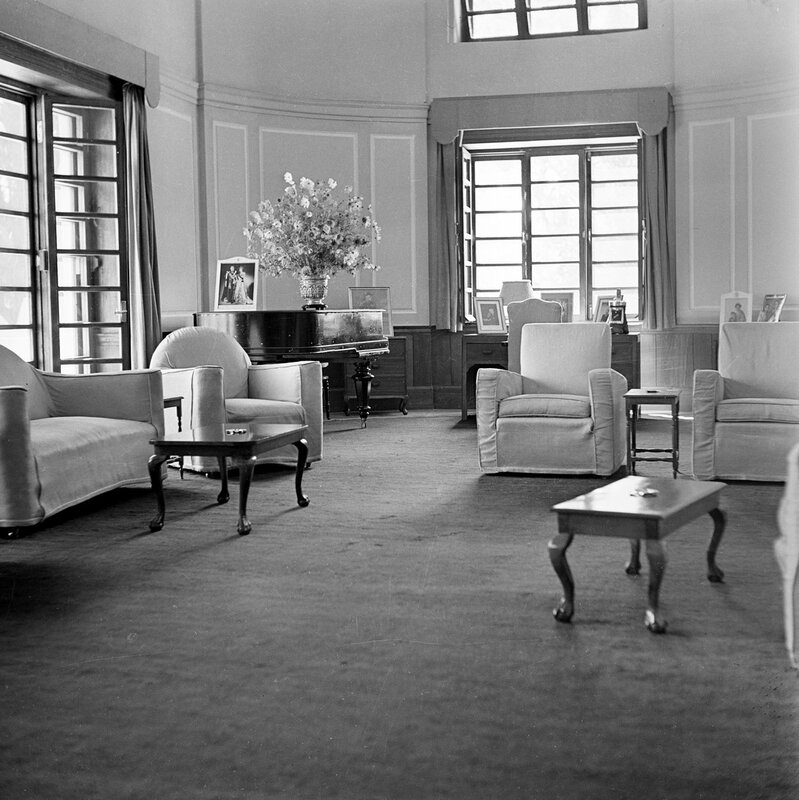 He had equal hopes of HM the King calling on him at Kakani in March 1972 and put in hand some refurbishment work to make the bungalow fit for the visit. Unfortunately, the king died six weeks before the visit and the royal family’s observance of a year’s mourning put paid to organising another. 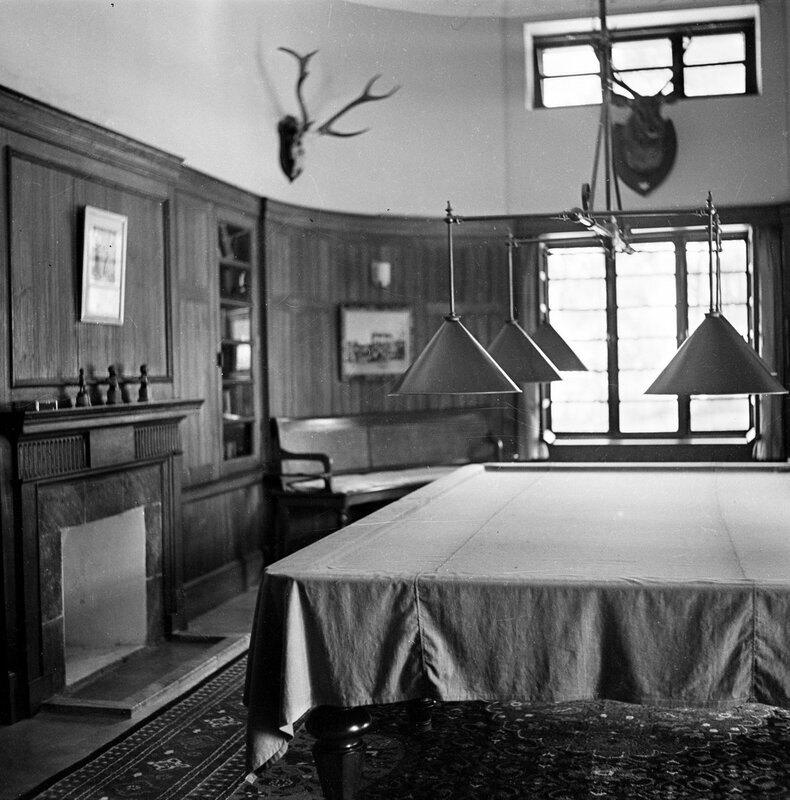 The bungalow remains in use today as the embassy staff’s retreat. It was seriously damaged in the 2015 earthquake [? under restoration]. 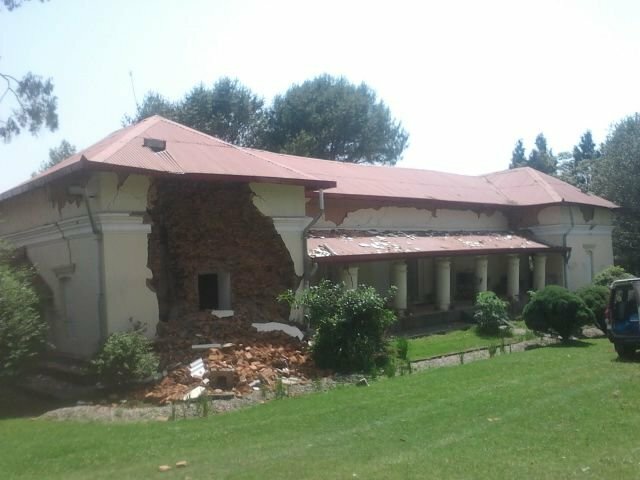 Kakani bungalow, after earth quake, 2015.